NOTE: 18 additional photos of this instrument are available. Click here for information. loud, and VERY nice sounding. I obtained this bolt-on neck for $5 at a local resale shop. E-bay often offers bass necks inexpensively. The bottom & the sides are built from a four-foot long, 3/16"
considerably more complicated than it actually is. few inches long - to be trimmed off later). thickness except for one layer. I made my kerfs about 3/8"
to 1/2" apart. Make them as parallel as possible. serve as guides for the easily bendable kerfed side's bottom. - For the large bout end of the instrument, I used a 1"
angle brace for increased stability. the block like with the other block. - I braced the back with three strips of wood, about 3/8"
sanding part at the proper angle). weighted these braces while the glue dried. atop all sides, cubes & end blocks. Weight heavily. - A friend planed/sanded up some knot-free pine to 3/16"
the two sets. Titebond glue was applied then the 3/8"
both sides of the joint. | |_____________________|      | This stick "elevates" crack. ("H) near both ends of the joined-together soundboard. 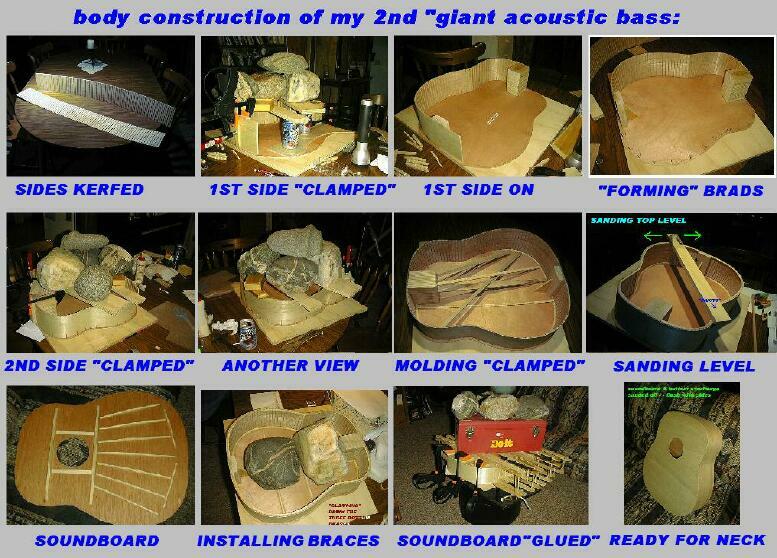 before cutting out the soundboard's shape. plugs are smooth & flush. a permanent bridge out of any hard or even softwood. enough. String up the animal and you're in business! 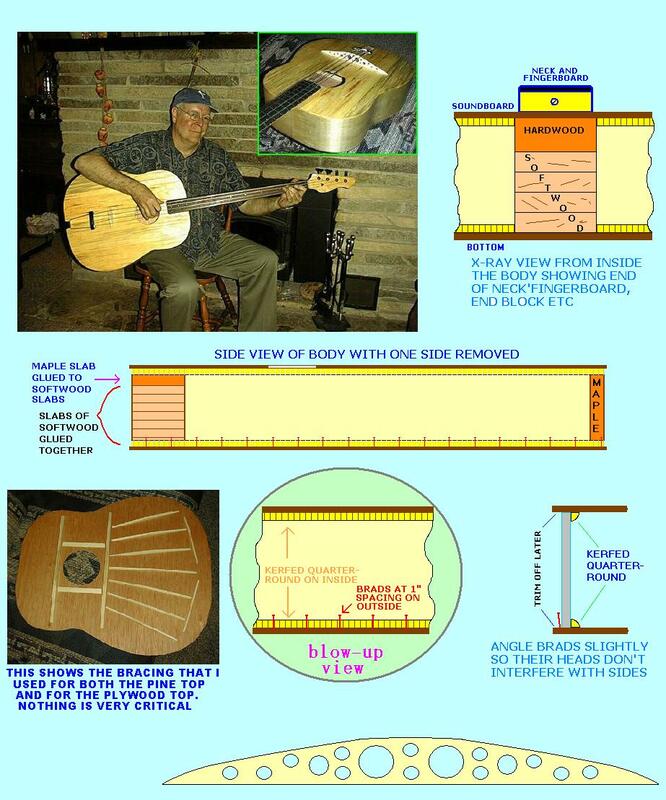 spread out over a wider area of the soundboard. less than say an upright bass bridge. strings -- they play and sound great.